Category Archives for "water filters"
In 2015, US families bought over 50 billion water bottles because most people don’t think about using water filters. Many people spend money on water bottles instead of using water filters. Although water bottles seem cheap, in the long run using one of these types of water filters is more affordable. Using water filters also reduces the amount of plastics in our landfills. Research has shown that some water bottles can still contain foreign contaminants (such as BPA) which can have a negative health effects. Even more alarming – a staggering 25% of bottled water produced may not go through the full filtration process. In this case, it is no better than tap water. Most people have no clue where to start when buying water filters – there are so many different categories. So we are going to discuss the best water filters. We start with the 5 types of Water Filtration that are available on the market and why you should stop using water bottles. Water filter pitchers work by filling a small tank at the top of the pitcher with tap water. The water slowly drips into the bottom tank through a filter. Typical filters last around 2 months. *Please note – no Water Pitcher Filters can remove fluoride. It is better to choose a reverse osmosis water filter if you are worried about fluoride. We have an entire post with a detailed look at choices for the best water filter pitcher comparison. The MAVEA 1005722 is one of the leading brands when it comes to Water Pitcher Filters. This water filter uses silver to prevent any foreign bacteria from entering the water. It comes with a “smart meter” which can measure water volume and notify you when the filter needs to be replaced. 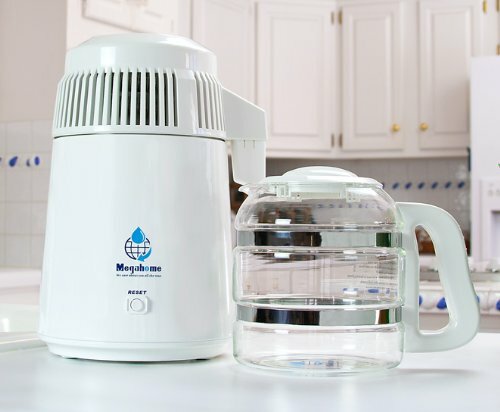 Many customers have compared MAVEA to “Brita Everyday”. MAVEA is certified to remove a lot more impurities than Brita. It is easy to refill and for the price is definitely worth the investment. 65% of customers have rated this product 5-stars. Faucet water filters attach to the water tap in the kitchen. They normally have a way to select whether the water coming out of the faucet is filtered or not. These filters last about 2 months as well. *Please note – no Faucet Filters can remove fluoride. It is better to choose a reverse osmosis filter if you are worried about fluoride. We have an entire post with a detailed look at choices for the best faucet water filter comparison. PUR Faucet filter is the best-rated filter on Amazon. It is made to remove 70+ foreign contaminants from the water we drink every day. It comes with an electronic filter life reader so you will be able to check when the filter needs to be replaced. PUR is a combination faucet filter and carbon filter. 40% of customers have rated this product 5-star. This is because of the filter life in most cases. If you don’t mind upgrading your filter every 2-3 months then a PUR filter can save a lot of money. It is certified to remove 70+ contaminants (including more than 95% of lead and mercury) which is much better than bottled water. Carbon filters are generally found on the water line going to the ice maker in typical refrigerators. They are the best water filter if you are looking for small size and the ability to tuck it out-of-sight. Carbon filters are also the second stage of an RO water filter assembly. Nahla Pure is the best carbon filter to purchase. It filters the kitchen sink water. It can be easily installed under the kitchen sink with normal household tools. This filter is installed directly to the standard 3/8″ cold water line. Smaller in size than RO Filters. Again, the rating for this product is 81% 5-star on Amazon. Customers have argued that the carbon filter is the game-changer for this filter. It removes the chlorine taste better than any other filter. There are a number of complaints about the filter having the wrong parts. Reverse Osmosis (or RO filters) are extremely good at removing most impurities. RO systems usually are 3 or 4 stages with each stage a filter with smaller holes for catching impurities. The last stage is a RO filter. Since there are a number of stages, RO water filter systems are more expensive as a result. We have an entire post with a detailed look at choices for the best reverse osmosis system comparison. If you’d like to learn more about RO water filters, try looking at our “how does reverse osmosis work​” webpage. APEC is the leading brand for RO filters. They use a 4-stage filtration process. Stage 1: Sediment Filter: Entry water is filtered through a polypropylene filter to remove any dust or rust. This stage filters out the larger particles from the water. Stage 2: Carbon Filter. A carbon filter block removes harmful chemicals in tap water and removes the chlorine which can damage the R.O. filter. Stage 3: Reverse Osmosis. The reverse osmosis membrane removes 99% of the foreign bacteria and other impurities such as arsenic, lead and fluoride. Stage 4: Carbon Filter. In the last stage, the coconut carbon filter removes any remaining bad odor and taste. Reverse Osmosis filters remove 99% of foreign contaminants in the water we drink. On Amazon, 92% of people have given APEC 5 stars, which is rare on any product. This definitely shows that this product has a large customer following. Customer reviews show that this filter can last a year if well cleaned and looked after. The filter lasts for a full 12 months – which is incredible in comparison to some filters that breakdown quickly. It is also easy to maintain and still works out a lot cheaper than water bottles – an average family spends $346 per year on bottled water. Water distillers work by boiling the water, capturing the pure steam, and cooling and condensing it. The impurities are left behind while the steam condenses into purified water – like rain. The best water distiller to buy would be “MegaHome Countertop Water Distiller” as shown by the large number of positive reviews. It distills 1 gallon every 6 hours which is why this isn’t a more popular choice for water purification. There is a 78% 5-star rating on Amazon, which is pretty good. There are a lot of happy customers. Most complaints are about the taste. Weird tasting water is a common complaint about distilled water. Adding in “good” minerals may help add good taste but that defeats the purpose. Water Distillers are more expensive than Water Pitchers and Faucet Filters but they claim to remove more contaminants (TDS). Out of all the types of water filters, we would recommend Reverse Osmosis water filter systems as the best water filter to invest in. Not only are nearly 100% of customers happy but it also is a long-term investment. The product lasts a lot longer than other filters and is easy to maintain. It can be installed underneath the sink. RO Filtering removes the worst contaminants. Reverse Osmosis Filters are popular due to the incredible filtering qualities. They have been proven to remove a lot more contaminants than any other water filter. APEC’s purer, tastier filtered water will definitely save you money in the long run when compared to water bottles. It is worth scrapping water bottles and investing in water filters. Is tap water really safe for drinking? Well, that is a controversial question. The truth is that municipalities do their best to ensure that they provide clean water. Unfortunately, the water they deliver is not clean enough. With a Reverse Osmosis (RO) system in place you can be certain that the water you drink is free of most types of contaminants. The process of reverse osmosis involves water being filtered through a semi-permeable membrane (see our page for additional information about how a RO filter works). A typical RO system has four filters (the sediment filter, carbon filter, the reverse osmosis filter, and the post carbon filter). Each filter is responsible for removing certain types of contaminants. Generally, RO systems get rid of contaminants such as viruses, bacteria, protozoa and chemicals. The list below shows the types of chemicals removed and the percentage of effectiveness of the system in their removal. The percentages indicated above are generally accepted in the industry. However, an RO system could perform better or worse than the figures noted above because other factors could affect the filtration process. Such factors include the PH, temperature, pressure and chemicals in the water. The above chart is handy for comparing the Consumer Confidence Report that details ﻿﻿what’s in your water﻿ to potential pollutants. Reverse Osmosis is primarily based on the physical process of filtration. Filtration occurs when matter (gas, liquid or solid), passes through the pores of a medium or an absorbent material. Where water contaminants are concerned, filtration is dependent on the size of contaminant, and where applicable, its charge. To increase the effectiveness of the RO filters, pretreatment of drinking water may be necessary. The pretreatment might involve adjusting the pH, adding coagulants in the water or altering the chlorine levels. There are three types of filtration described by the ﻿CDC﻿ and understanding them will give you a clearer idea of how a good water filtration system works. Water first goes through the microfiltration to remove large particles that would otherwise destroy delicate filters such as the RO membrane. The 2nd stage is ultrafiltration to trap larger chemicals, bacteria and protozoa. In many systems, there may be 2 of these filters. The last filtration stage is nanofiltration or Reverse Osmosis (of these 2 choices, reverse osmosis is better) which gets rid of most chemicals to produce safe drinking water. No – Filter is not effective at removing viruses such as Rotavirus or Hepatitus A.
Ultrafiltration filters have a pore size of about 0.003 microns with a range from 0.003 on the lower scale to 0.05 on the upper scale. The Molecular Weight Cut Off (MWCO) on these filters is between 13,000 and 200,000 Daltons. In the RO system, the ultrafiltration filter is the carbon filter. Yes – Filter is effective in removing bacteria such as E. Coli, Salmonella, and Shigella. Maybe – Filter is moderately effective at removing viruses such as Rotavirus and Hepatitus A.
Nanofiltration filters have even smaller pores with pore sizes between 0.001 microns and 0.01 micron. The MWCO of these filters is between 200 and 2,000 Daltons. Like the ultrafiltration filters, the effectiveness of nanofilters is affected by the size of particles, the weight, and the charge. Nanofilters aren’t typically used in a RO filter because the even smaller pores of the Reverse Osmosis membrane are used. Yes – Filter is effective at removing viruses such as Rotavirus and Hepatitus A. Maybe – Filter is moderately effective at removing chemicals such as metal ions of copper, chromium, or lead. Reverse Osmosis membrane filters have the smallest pores at about 0.0001 micron or 0.1nm. These filters are best at filtering out ions and molecules that the other filters can’t. In the RO system, the RO membrane filter is the last stage and filters out the smallest particles. Yes – Filter is effective at removing chemicals such as chromium, copper, sodium, and lead. RO systems are cheap and easy to install. Also, these systems do not require lots of maintenance but they do require filter changes are regular intervals – typically every 6 months to a year depending upon the amount of contaminants in the water.